BPS 8 barcode positioning system. 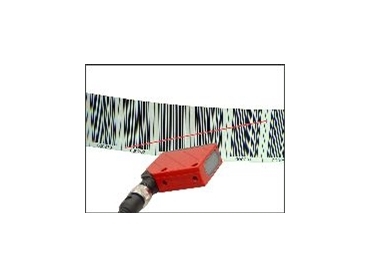 THE new BPS 8 barcode positioning system from Leuze Electronic is easy to use and operate. In conjunction with the MA 8-01 connection unit, the system permits low-cost solutions within the industrial sector. Optical measuring methods are particularly suitable for establishing the positions of rail-mounted industrial trucks, overhead carrier systems, hoists, rack handling and similar automatic transport systems. Available from Balluff Leuze , they function without mechanical wear or slippage. With the Barcode Positioning System (BPS) from Leuze, positions can be exactly determined in both horizontal and vertical travel. The BPS determines its position relative to the barcode tape by means of a visible red light laser. The codes which are read within the scanning range of the laser beam make it possible to calculate the position with millimetric accuracy using a combination of code information and code position. A large scanning distance is able to compensate for mechanical tolerances. In addition to the BPS 34/37 already mentioned, Leuze has developed a new variant which has been optimised from the functional point of view. The new BPS 8 transfers the position values which have been calculated to the higher-level control system via an RS232 interface. The MA 8-01 can adapt the level for the supply voltage as well as for the switching input and output. In addition, this means that an RS485 interface is available. Accommodated in small, robust metal housings, the new BPS 8 units fulfil Protection Class IP67. The equipment is simple to assemble and allows precise positioning up to a distance of 10,000 metres.